This chemistry dictionary offers the chemistry definitions starting with the letter O. These glossary terms are commonly used in chemistry and chemical engineering. Click the letter below to find the terms and definitions beginning with that letter. octahedral – Octahedral is defined as possessing the symmetry of a regular octahedron. Having a three-dimensional shape with 6 vertices and 8 faces, where each face forms an equilateral triangle. octane number – Octane number is a value used to indicate the resistance of a motor fuel to knock. Octane numbers are based on a scale on which isooctane is 100 (minimal knock) and heptane is 0 (bad knock). Examples: A gasoline with an octane number of 92 has the same knock as a mixture of 92% isooctane and 8% heptane. octet – Group of eight valence electrons surrounding an atom. All noble gases have an octet of valence electrons, with the exception of helium. octet rule – Refers to the principle that bonded atoms share their eight outer electrons. The octet rule is a ‘rule’ that is sometimes broken. ohm – The ohm is the SI unit of electrical resistance. The symbol for ohm is Ω. One ohm is equal to the resistance between two points when a potential difference of one volt causes a current of one ampere. ohmmeter – An ohmmeter is an instrument used to measure electrical resistance. olefin – An olefin is a hydrocarbon containing a carbon-carbon double bond. oleum – Oleum is a solution of concentrated sulfuric acid (H2SO4) and sulfur trioxide (SO32-). oligomer – An oligomer is a macromolecule consisting of a small number of repeating mer units. An oligomer differs from a polymer where removal of mer units in an oligomer can change the properties of the larger molecule. oligosaccharide – An oligosaccharide is a saccharide polymer with a small amount of component sugar molecules. open system – An open system is a system that can freely exchange matter and energy with its surroundings. optical activity – Optical activity is defined as a property in which a substance is able to rotate the plane of a beam of transmitted light; a characteristic of a substance which has a chiral center. optical density – Optical density is a measure of the quantity of light absorbed by a sample. optical isomerism – Situation in which members of a pair of molecules possessing an identical molecular formula rotate a beam of plane polarized light in opposite directions from each other. Molecules which are capable of optical isomerism have at least one chiral center. orange oxide – Orange oxide is a common name for uranium(VI) oxide (UO3). Orange oxide is produced during the uranium enrichment process of uranium hexafluoride. orbital – Electron cloud having an energy state described by given values of the n, ℓ, and mℓ quantum numbers. An orbital can contain two electrons with paired spins and is often associated with a specific region of an atom. Example: The electrons in the 2px orbital of an atom are generally found within a dumbbell-shaped cloud about the x-axis. organic chemistry – Organic chemistry is the chemistry discipline that is concerned with the study of compounds containing carbon that is chemically bonded to hydrogen. Organic chemistry encompasses the synthesis, identification, modeling, and chemical reactions of such compounds. organic hydroperoxide – Organic hydroperoxide is a derivative of hydrogen peroxide (H2O2) where one hydrogen is replaced by an alkyl or aryl group. The general form of an organic hydroperoxide is R-O-O-H where the R is either an alkyl or aryl group. organic peroxide – Organic peroxide is a derivative of hydrogen peroxide where both hydrogen atoms are replaced with either alkyl or aryl group. The general form of an organic hydroperoxide is R-O-O-R’ where the R and R’ are either alkyl or aryl groups. organobromide – An organobromide is an organic compound that contains one or more bromine atoms. Example: Bromoform is an organobromide. organochloride or organochlorine – An organochloride is an organic compound that contains one or more chlorine atoms. Example: Chloroform is an organochloride. organofluoride or organofluorine – An organofluoride is an organic compound that contains one or more fluorine atoms. Example: Fluoroethylene or vinyl fluoride is an organofluoride. organoiodide or organoiodine – An organoiodide is an organic compound that contains one or more iodine atoms. Example: Iodoform is an organoiodide. organometallic – Organometallic refers to organic compounds that contain at least one metal atom bonded to a carbon atom. Example: Zeise’s salt contains an atom of platinum and was one of the first organometallic compounds discovered. osmium – Osmium is the name for the transition metal element with atomic number 76 and is represented by the symbol Os. 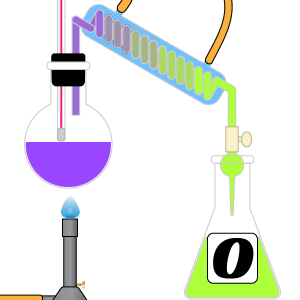 osmometry – Osmometry is a laboratory technique to find the molecular weight of an unknown compound by determining the osmotic strength of a solution. Osmometers can find the osmotic strength of a solution or colloid using data from a semipermeable membrane, freezing point depression or vapor pressure. osmosis – Osmosis is the process where solvent molecules move through a semipermeable membrane from a dilute solution into a more concentrated solution (which becomes more dilute). osmotic pressure – Osmotic pressure is the name given to the hydrostatic pressure resulting from a concentration gradient across two sides of a surface, such as across a semipermeable membrane. oxidant – An oxidant is a reactant that removes electrons from other reactants during a redox reaction. Examples: Hydrogen peroxide, ozone, and nitric acid are all oxidizers. oxidation – Oxidation is the loss of electrons during a reaction by a molecule, atom or ion. Oxidation occurs when the oxidation state of a molecule, atom or ion is increased. An older meaning of oxidation was when oxygen was added to a compound. Example: Iron combines with oxygen to form iron oxide or rust. The iron is said to have oxidized into rust. oxidation number – The oxidation number is the electrical charge that the central atom in a coordination compound would have if all the ligands and electron pairs were removed. Usually, the oxidation number has the same value as the oxidation state. oxidation state – The oxidation state is the difference between the number of electrons associated with an atom in a compound as compared with the number of electrons in an atom of the element. In ions, the oxidation state is the ionic charge. In covalent compounds, the oxidation state corresponds to the formal charge. Elements are assumed to exist in the zero oxidation state. oxide – An oxide is an ion of oxygen with oxidation state equal to -2 ( O2- ). oxidizer – Another word for oxidant. See definition above. oxidizing agent – Another word for oxidant. See definition above. oxime – An oxime is an organic compound containing the >C=NOH functional group. The general formula for an oxime is RR’C=NOH. Oximes where R’ is a hydrogen atom are called aldoximes. All other oximes are called ketoximes. oxoacid or oxyacid – An oxoacid is an acid that contains an oxygen atom bonded to a hydrogen atom and at least one other element. Examples: Sulfuric acid (H2SO4), phosphoric acid (H3PO4), and nitric acid (HNO3) are all oxoacids. oxyanion – An oxyanion is an anion containing oxygen. Examples: Nitrate (NO3–), Nitrite (NO2–), sulfite (SO32-) and hypochlorite (ClO–) are all oxyanions. oxygen – Oxygen is the name for the element with atomic number 8 and is represented by the symbol O. It is a member of the nonmetal group. oxygenate – The term oxygenate refers to compounds containing oxygen. Examples: Oxygenates such as ethers and alcohol are commonly added to fuel to promote cleaner combustion. ozonation – Ozonation is a chemical process that adds ozone (O3) to a substance. Examples: Drinking water can be ozonated to kill microorganisms that can cause waterborne diseases. ozone – Ozone is an allotrope of oxygen containing three oxygen atoms. The chemical formula for ozone is O3. ozonide – Ozonide is an unstable anion derived from ozone. Ozonide has a chemical formula of O3–. Ozonides are also organic compounds formed when ozone is reacted with a compound.